What Are the Benefits of DiSC? We promise to send actionable strategies to build teams and develop leaders. Click the button below to add the EMERGENETICS® Profile to your wish list. The Emergenetics Profile includes: debrief call with a certified Emergenetics Associate; full narrative report; access to the Emergenetics+ App; pre employment testing resources; and tips for immediate application. The power behind the Emergenetics Profile is that it represents a combination of characteristics that emerge from your life experiences during pre employment testing, plus the genetics with which you were born. We have scientifically determined that each individual’s temperament can be described in terms of three Behavioral Attributes and four Thinking Attributes. Although you are able to tap into all Behavioral and Thinking Attributes, some come more naturally than others. When individuals are able to harness preferences, engagement increases and team members interact with higher levels of collaboration and energy. Each person possesses, to a certain degree, each Thinking Attribute. It is the energy you generate around these Attributes that distinguishes your personality. Awareness of Thinking Attributes during pre employment testing provides team members with the opportunity to leverage strengths and energy providing increased engagement and collaboration across the team. 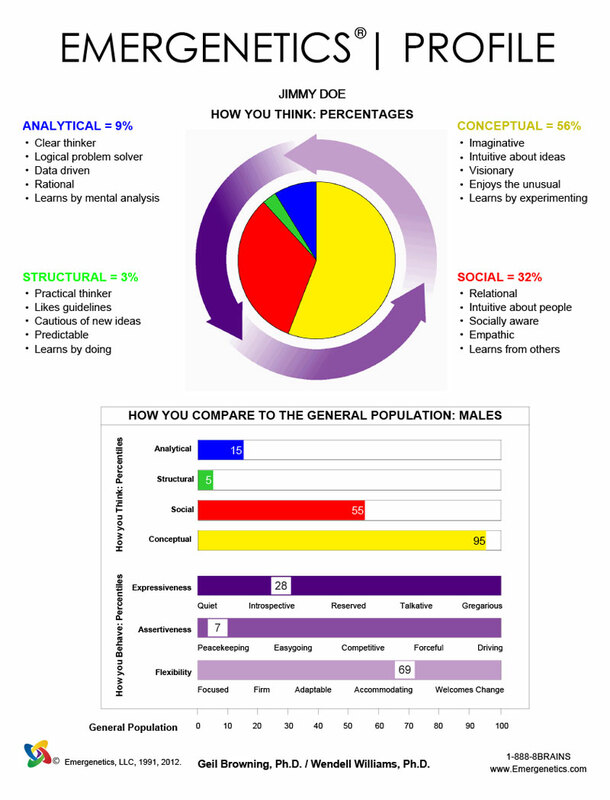 The Emergenetics Profile highlights the percentages across each of the Thinking Attributes for job asessment tests. Ultimately individuals are a blend of the four Thinking Attributes with one or more Attributes being more prominent. A Thinking Preference is determined with a result of ≥ 23%. Analytical Thinking (represented by the color blue) is logical, rational, objective, factual, and skeptical. Structural Thinking (represented by the color green) is practical, cautious, predictable, and methodical. Social Thinking (represented by the color red) is sympathetic, connected, socially aware, and intuitive about other people. Conceptual Thinking (represented by the color yellow) is imaginative, creative, innovative, visionary, and intuitive about ideas. The Behavioral Attributes are what people notice about you. They can’t see how you think, but they can observe how you behave. To refine the process further, the Behavioral Attributes are described along a spectrum. This continuum is split into thirds to provide individuals with a clear understanding of how scores fall across each of the Behavioral Attributes. Expressiveness is the outward display of emotions toward others and the world-at-large. People who are on the left side of the Expressiveness continuum (first-third) are reserved, quiet, private, and self-sufficient. People on the right side of the continuum (third-third) like to attract attention. They are outgoing, affectionate, and easy to talk to. Assertiveness is the style and pace with which you advance thoughts, feelings, and beliefs to drive results. People on the left side of the Assertiveness continuum (first-third) are easygoing, amiable, and even passive. People on the right side of the continuum (third-third) are driving, competitive, and even confrontational. Flexibility is our willingness to accommodate the thoughts and actions of other people – adaptability to change. People who are on the left side of the Flexibility continuum (first-third) have strong opinions, prefer defined situations, and can be stubborn. People on the right side of the continuum (third-third) are accommodating, open to suggestions, and can be indecisive. Consider an individual who has an Analytical Thinking preference. This person might be seen as logical, enjoys research, learns by mental analysis, and makes conclusions based on facts. Assessments that measure across four areas will not highlight the key personality differences of how an Analytical Thinker might show up. The inclusion of Behavioral Attributes in the Emergenetics® Profile provides insight into different approaches across Expressiveness, Assertiveness, and Flexibility. The bottom line – Analytical Thinkers cannot be stereotyped. This is critical to increasing understanding of individuals and driving engagement across teams. Corporate Teams and Profile Assessments are Independent Authorized Distributors of Wiley DiSC Products.